Studios back in the day were always sending their players out on screwy promotional chores. This time Dorothy Sebastian's been obliged to pick up the latest edition of Screen Mirror from the local "News-O-Mat", located at a then-nearby service station. Now this is something none of us are ever likely to do. For one thing, there are no more service stations. There are, however, plenty of self-service stations, where customers are privileged to splatter overpriced gasoline all over themselves whilst trying to fill their tanks. 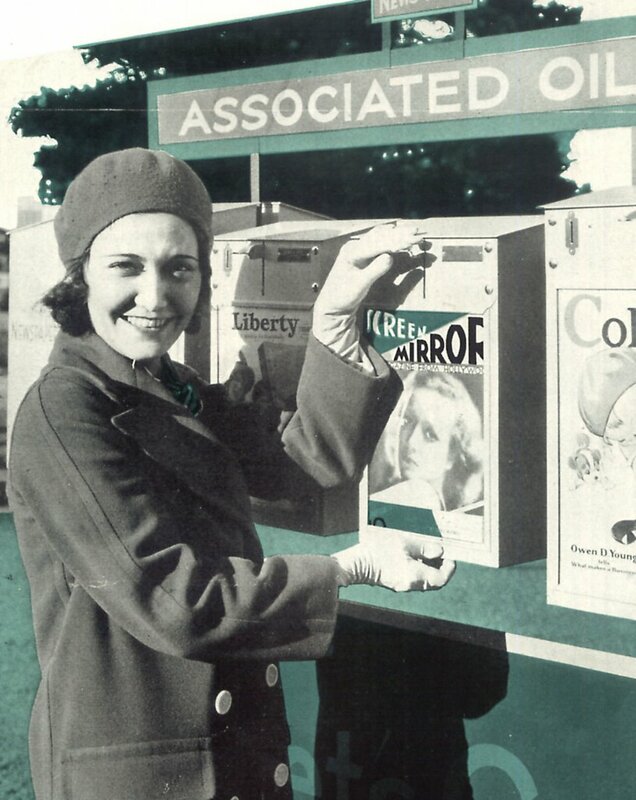 Notice too that Dorothy can choose Liberty and/or Collier's among her News-O-Mat purchases. Those were, like, news magazines. I read the other day that only old people read news magazines now. And I didn't read that in a news magazine, or a newspaper. It was right here where we are --- online. Sad to say, we'll never share Dorothy's adventure in news gathering. This News-O-Mat no doubt closed within minutes after the pic was taken on February 7, 1931. I'd venture to say, in fact, that this was the only News-O-Mat in existence, brought in and carried off by MGM and the Screen Mirror folks within an hour of Dorothy's posing. The still was probably used as a fashion tie-in as well. I'll bet it was 75 degrees the day they shot this ... and she's wearing that smart coat and matching cap. I wonder if people like Dorothy Sebastian had any understanding of the complex studio machinery that engulfed stars in those days. Guess not. She likely just showed up, stood where they told her to stand, and collected the pay packet. Dorothy had to question the whole thing eventually, because it was around this time that MGM let her go. Why did they do it? She headlined with Joan Crawford and Anita Page in that Daughters/Maidens/Brides trilogy, and she's Buster Keaton's leading lady in Spite Marriage (... and was awfully mean to him in that, though much more accommodating off-screen, they say). He called her "Slam-Bam" Sebastian, or maybe it was "Slam-Bang". Either way, the monicker evokes all sorts of vivid imagery. Her voice for the talkies was not well liked. Too low, and too southern (she hailed from Alabama). I think she looked too much like Joan Crawford. In fact, I once mistakenly bought some stills of Sebastian in one of those Tim McCoy Metro "historical" westerns in the belief that it was Crawford. Anyway, Dorothy moved on to Columbia for a few jobs, then it was poverty row independents. She was even back with Buster in one of his better Educational subjects, Allez Oop. That was 1934, and, not to be unkind, but Dorothy had kinda let herself go. She was married to good 'ol soon-to-be-Hoppy Bill Boyd at the time, but by 1936, it was splitsville for them. Now here's some irony --- in 1939, she's back at Metro in The Women, playing a bit part as a shopgirl, and the big star is Dorothy's old co-star, Joan Crawford. I wonder if Joan took Dorothy to lunch. Maybe talked over times when the fates were kinder to Dorothy. Did Metro generate condescending publicity about loyal old friend Joan giving a washed-up colleague some charity? Studios used to put out that sort of thing a lot. We take care of our own. Pretty cruel. Must have been rough on Dorothy. She really wanted that career back, but she never got it. DeMille used her as an extra in Reap The Wild Wind; he was a good guy about things like that, and the togas on his pics were often filled with needy silent vets. Dorothy died awfully young in 1957 (born 1903). I read that when Buster's wife told him about it, he couldn't even remember Dorothy. Maybe he just said that to avoid trouble with the missus over an old girlfriend. Pretty sad either way.